Proudly made here in the U. S. A. with high quality thick Genuine American Bison Leather. Sleek stitches with hand-crafted beveled edge for a classic, and yet, contemporary look. Matching Black leather tab pin rest- enhances the unique details of the solid metal buckle and belt overall. Size is measured to the center hole with 5 belt-holes to adjust one size up and down. 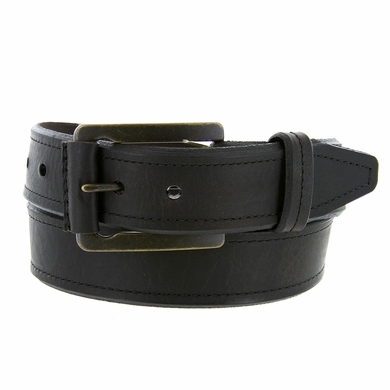 The best way to determine your size is to measure around wear you wear the belt and order that size. Feel free to contact us anytime.